That was pretty much like Chelsea on Wednesday night. 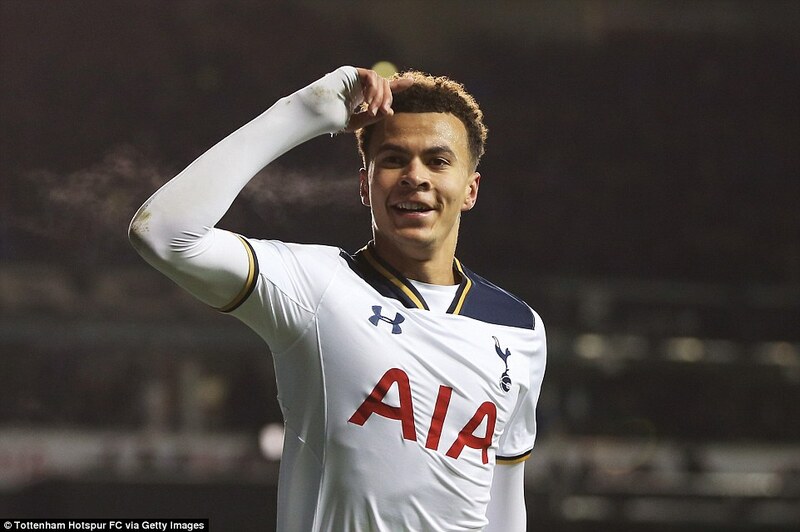 They conceded one goal from Dele Alli just before half-time; and then just after half-time they conceded the same goal again. Seriously, same goal. Same players in the build up, same provider, same scorer, getting in between the same two defenders to find the net in the same way. 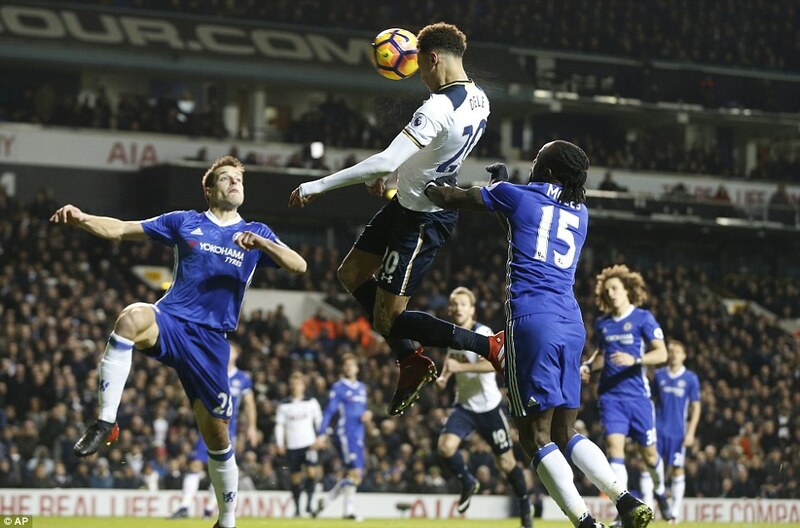 Dele Alli (No 20) opened the scoring in impressive fashion after meeting a cross from Christian Eriksen (No 23) with a bullet header. It was like watching an action replay, or attempting one of those spot the difference games with two almost identical panels. The faces in the crowd would have been different, the advertising hoardings, too. But the goals? They were as good as a carbon copy. Kyle Walker had the ball on the right, and slipped it inside for Christian Eriksen. 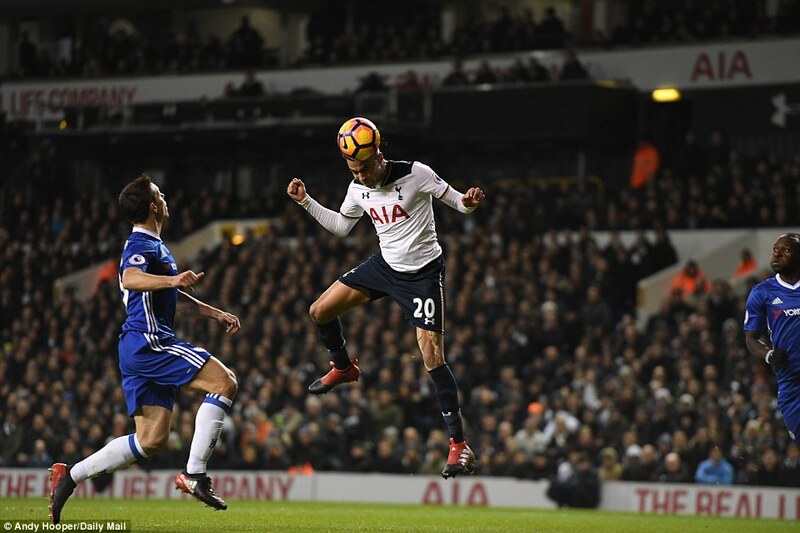 His header picked out Alli, who got between Victor Moses and Cesar Azpilicueta and sent the ball into the corner of the net in the direction from which it came. Take that as the description of the goal in the 54th minute, and the one in first-half injury time, too. You get two for the price of one here. Did it blow the title race wide open? Not really. 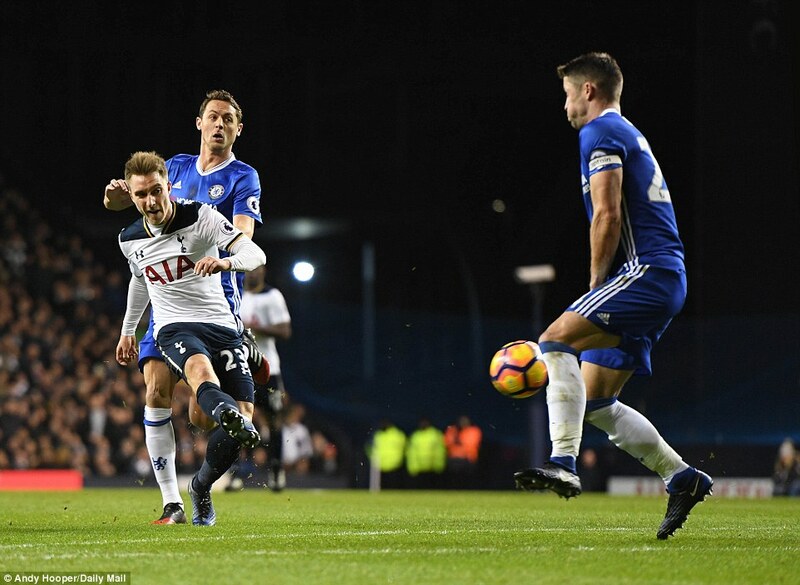 Chelsea are still five points clear, which is a significant advantage at this stage and few of their opponents will be as clinical as Tottenham were on Wednesday night. Yet what Alli did do was prevent this season becoming a procession. Had Chelsea won many would have been planning the May coronation in the first week of January. 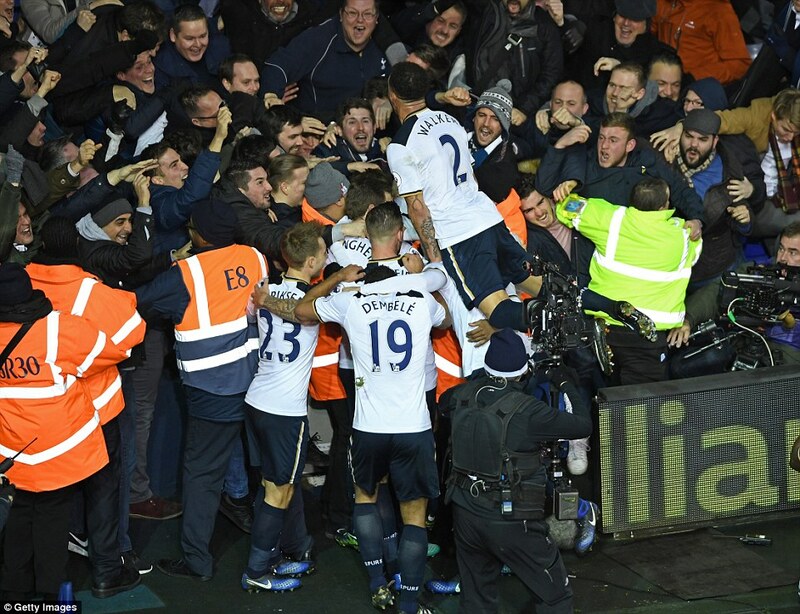 Tottenham would have been considered as good as out of it; Liverpool with a mountain to climb. Chelsea would have broken the all-time top division record for consecutive wins in one season, with the psychological advantage that entails. Now they must go again. They have to visit Anfield at the end of the month. Even if they win every league game until they date, they could still end the night a mere two points clear. This win said something about Tottenham, too. Their recent form is impressive, but the opposition has been weak. Not so on Wednesday night. This was a Chelsea team in historic form, and they picked them off. 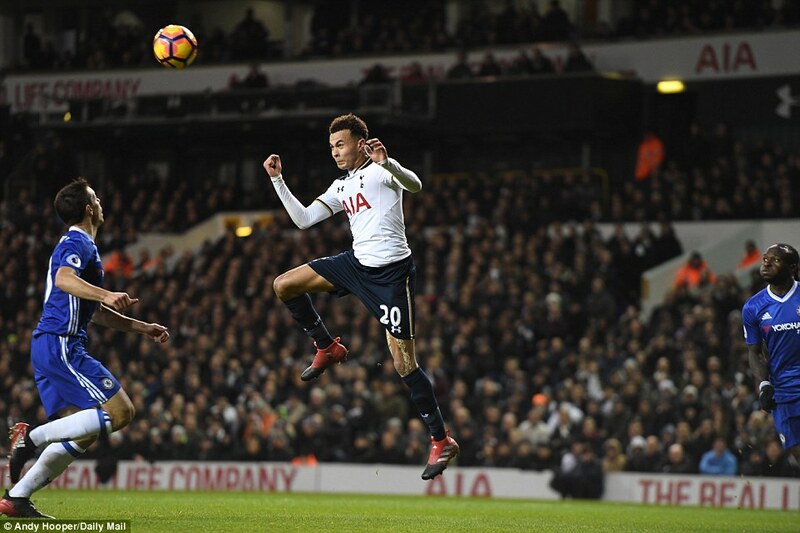 10 – Alli has equalled his Premier League goal tally from last season in just 19 games. He took 33 matches to hit 10 goals last year. 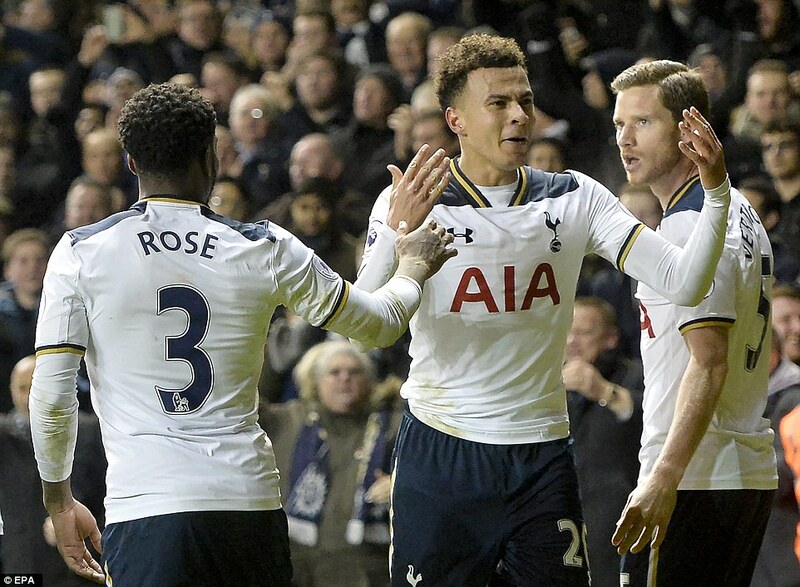 0 – Spurs have never lost a Premier League match that Alli has scored in. They have now won 12 and drawn four when he has scored. 7 – He has now scored seven goals in his last four league games. That is one more than he hit in his previous 26 matches in the competition. 20 – And he has 20 goals since the start of last season, more than any other player under 23 years old in Europe’s top five leagues. 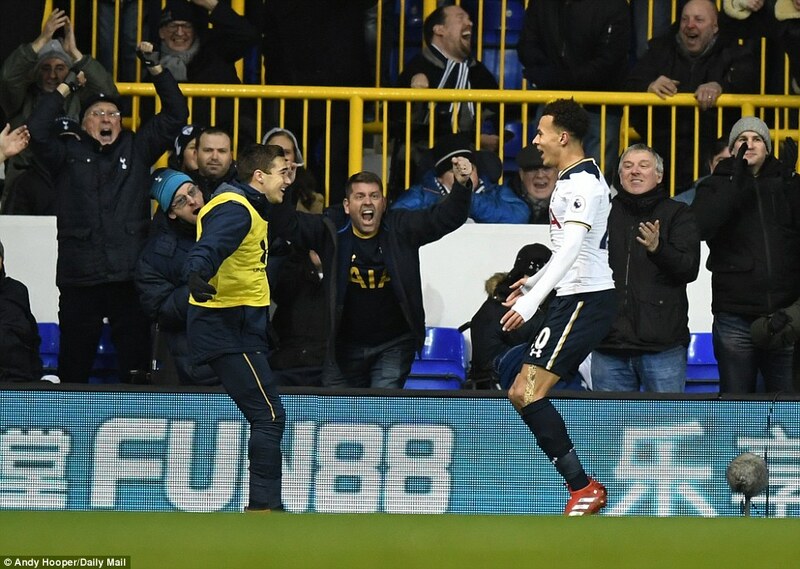 3 – This is the third game in a row that Dele Alli has scored twice. He scored doubles in the 4-1 win over Southampton, the 4-1 victory at Watford and on Wednesday night. 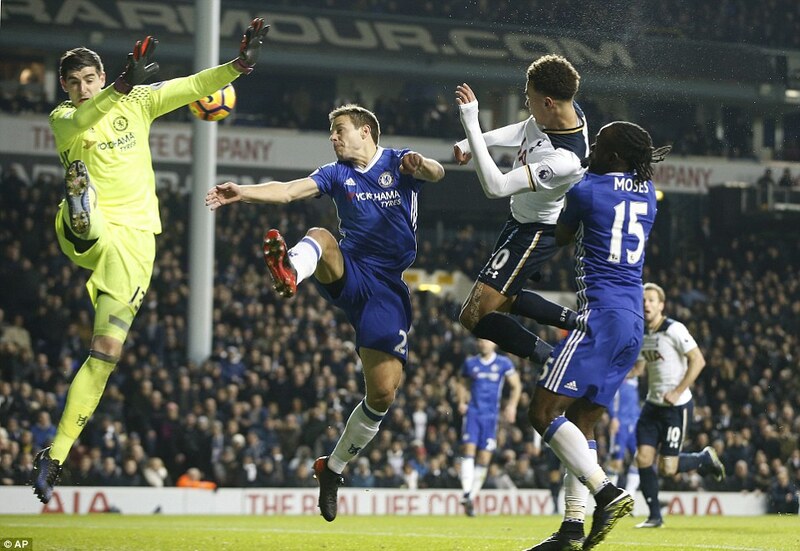 2 – The two headers he scored at White Hart Lane were the first Chelsea had conceded in the league all season. 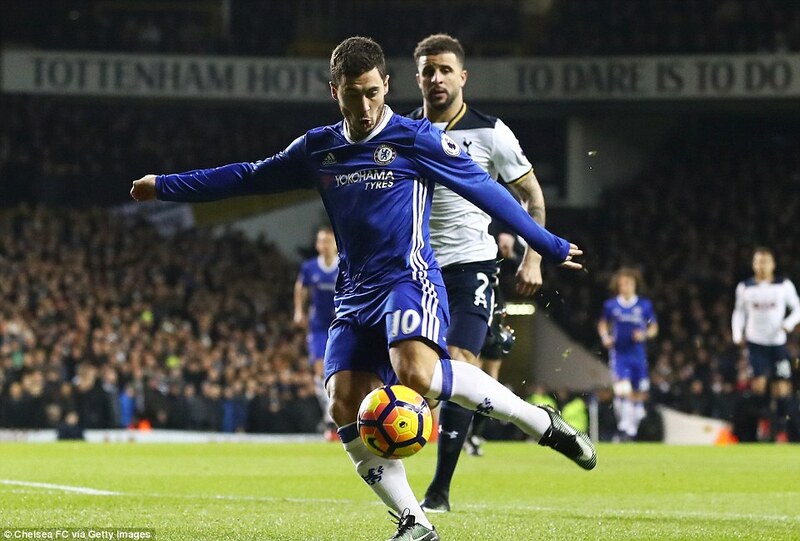 Chelsea had chances, of course, and should have equalised through Eden Hazard at the back post minutes before Tottenham went ahead, but Tottenham’s organisation made them worthy winners. They made Chelsea’s defence look vulnerable again, and few have managed that since Antonio Conte switched to three. The first-half was fast and furious but lacking in the poisonous mood that marked the meeting between these teams at the end of last season. 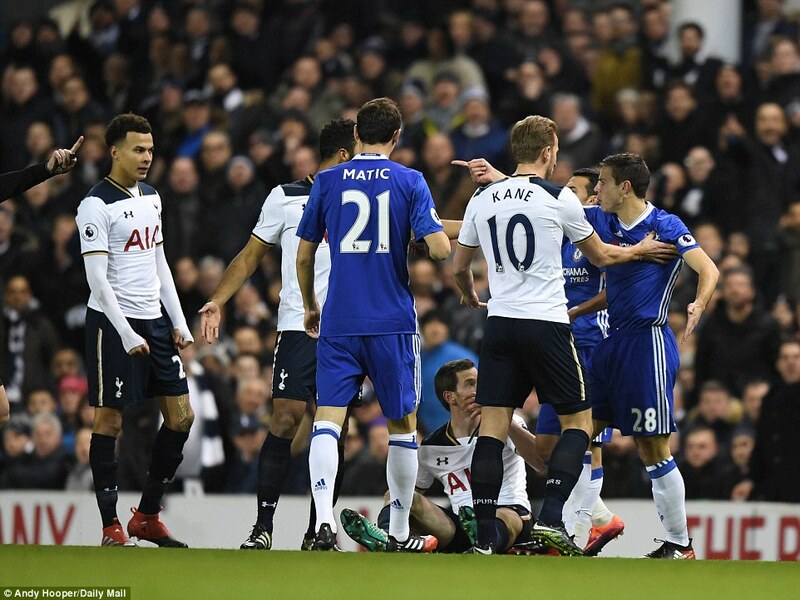 With no Tottenham players worthy of rowing with, Chelsea’s players took to arguing with each other. 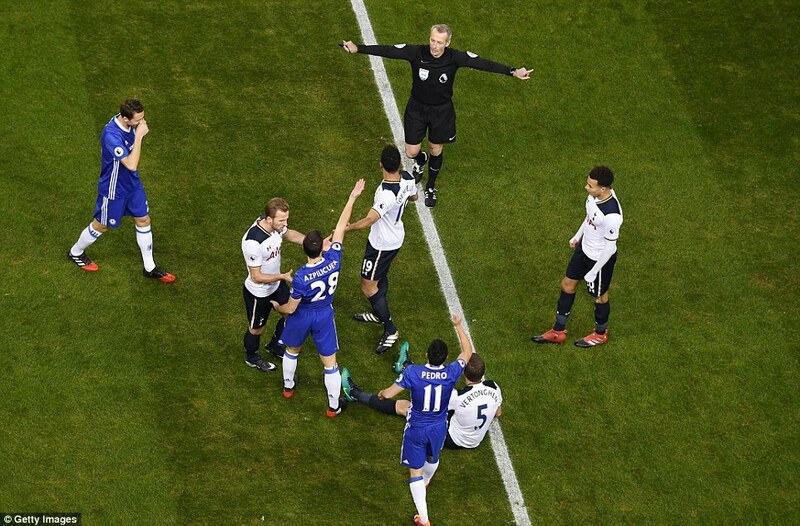 In the 22nd minute, a Tottenham corner yielded as typical Chelsea counter-attack. 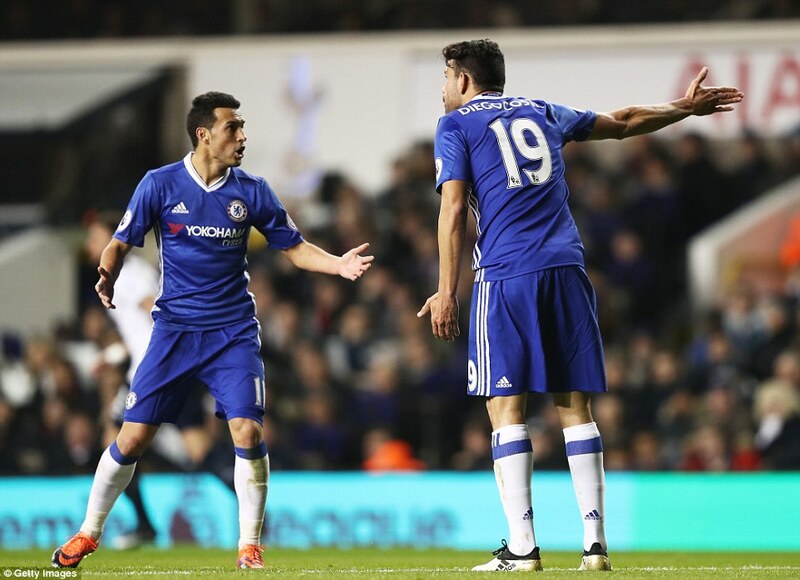 Eden Hazard burst away and found Diego Costa. He strode through and played a neat pass intended for Pedro, who failed to read it. 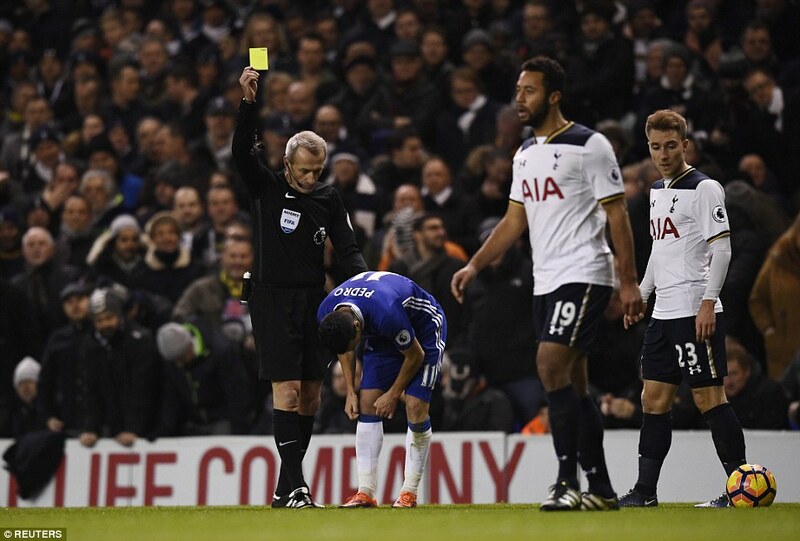 Costa was livid. In his mind, he was occupying Pedro’s role, so Pedro should play his. This was clearly the run he would have made had the positions been reversed. Why couldn’t Pedro see it? 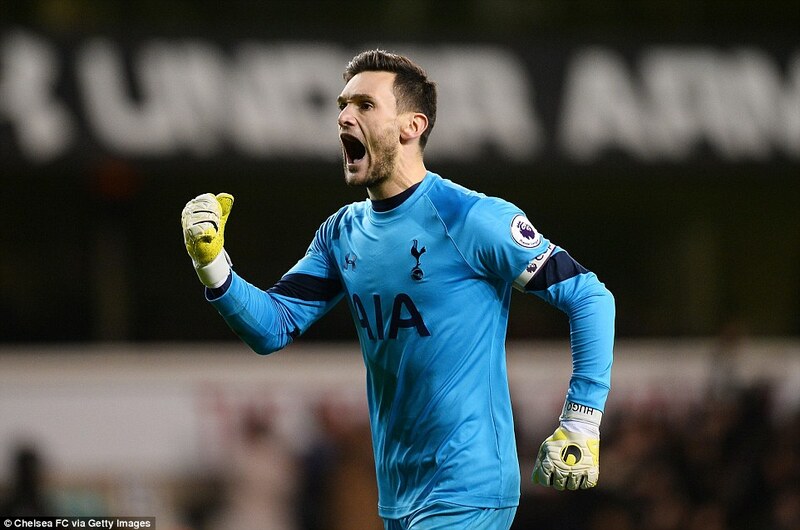 The heated dialogue continued while waiting for Hugo Lloris’s goal-kick, and then through the next break in play, neither man backing down. At least it showed they cared is the cliché line, although other players probably care just as much without wasting energy bickering. 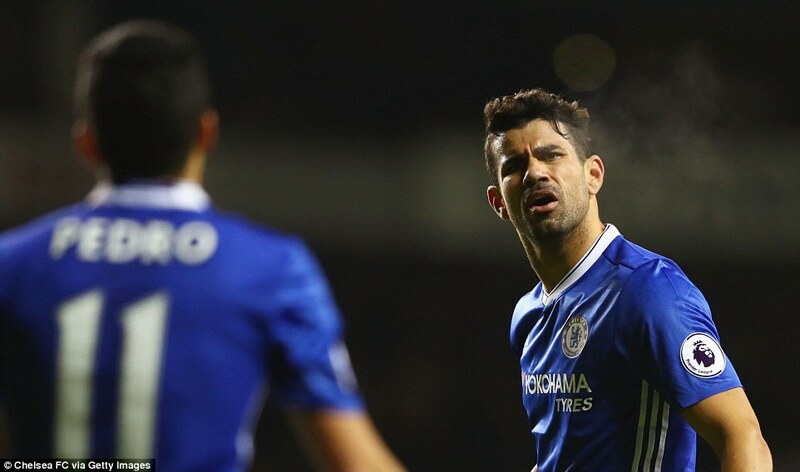 It certainly didn’t seem to do Costa’s equilibrium much good. In the 36th minute, he won a header sent out to Hazard and received a return pass near the edge of the area. It seemed in perfect range, but he blazed it well high and wide – highly out of character in his current form. Chelsea were finding it hard going all round, to be fair. 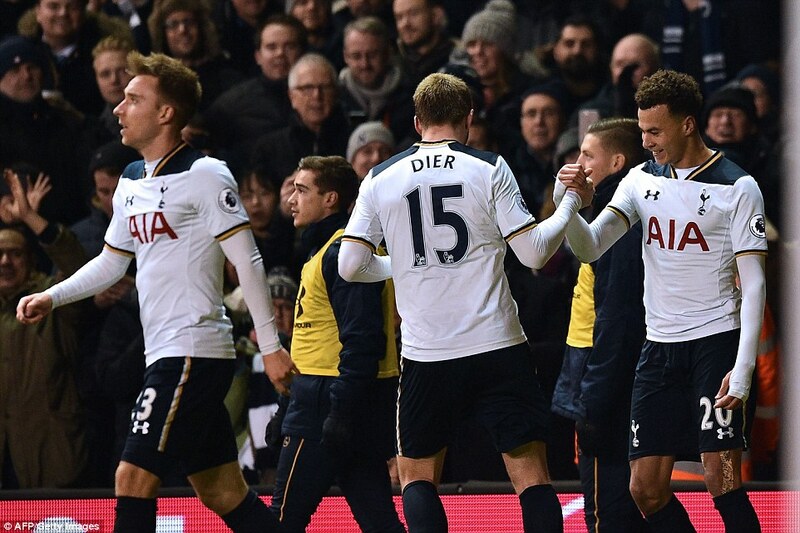 Tottenham are very strong defensively and were working incredibly hard, and successfully, at containment. On one occasion Chelsea exchanged passes into double figures, neat, snappy, fast, impressive. They ended up pegged back in their own half, 50 yards downfield from where they started. It was like watching Jurgen Klopp’s Liverpool at their best this season. It is easy to forget they are not the only exponents of the high press. 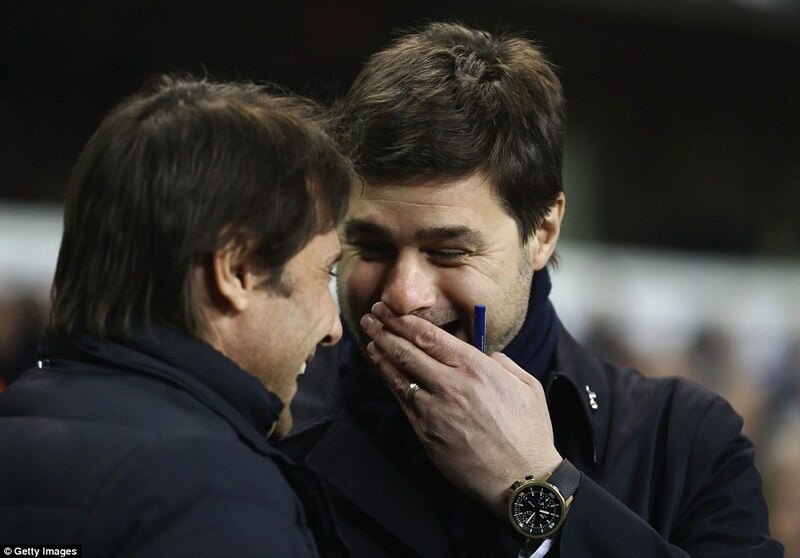 Mauricio Pochettino’s team killed Manchester City earlier this season the same way. Not that the sting is ever completely removed from Chelsea. They are always dangerous and one pass is all it takes. In the fifth minute, Nemanja Matic clipped one over the top and Hazard was away. He should have done better than a low shot across goal that travelled just wide of the far post. Equally, David Luiz will be disappointed with a 25th minute free-kick that flew harmlessly over the bar. 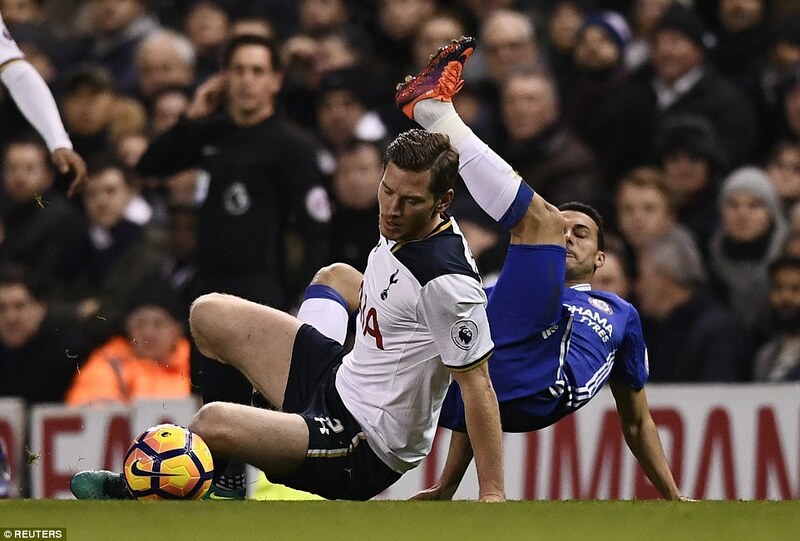 Yet if the early exchanges belonged to Chelsea, Tottenham grew in confidence the nearer the game moved towards half-time. 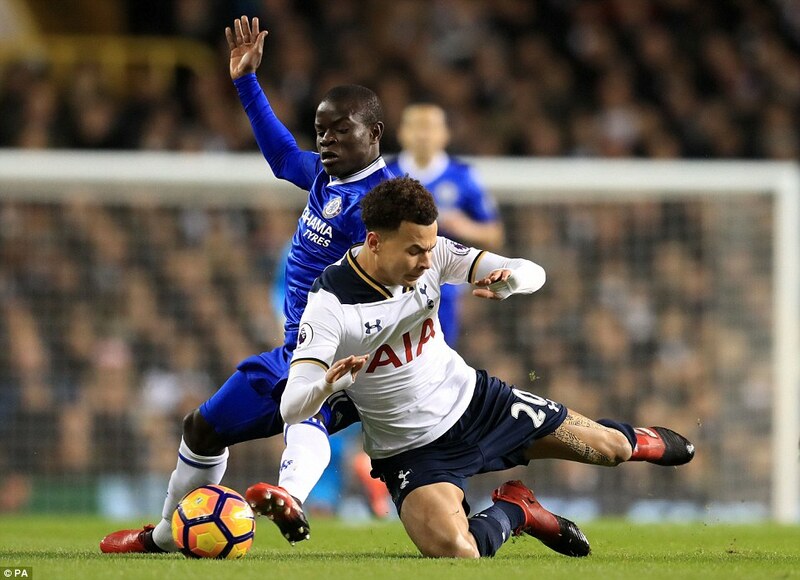 Victor Wanyama was doing a very good job matching N’Golo Kante in midfield, allowing Mousa Dembele room. 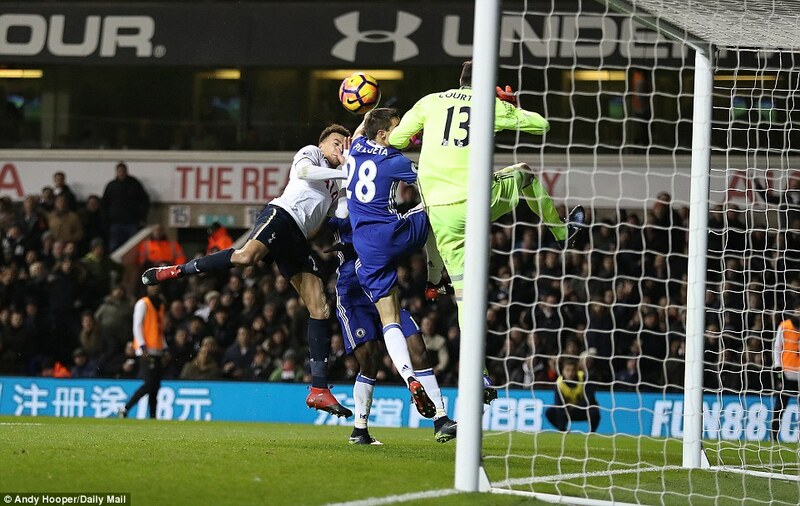 In the tenth minute he served notice, trying to pick out Harry Kane, and forcing Thibaut Courtois to speed off his line to gather. Mistakes were always at risked of being punished. 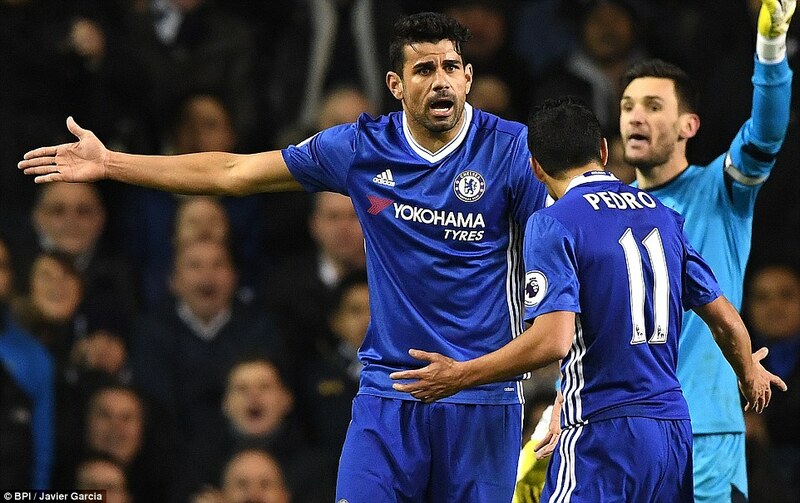 Costa lost possession in the 23rd minute – immediately after the row with Pedro, in fact – and Christian Erikssen should have done better with his shot on the break. 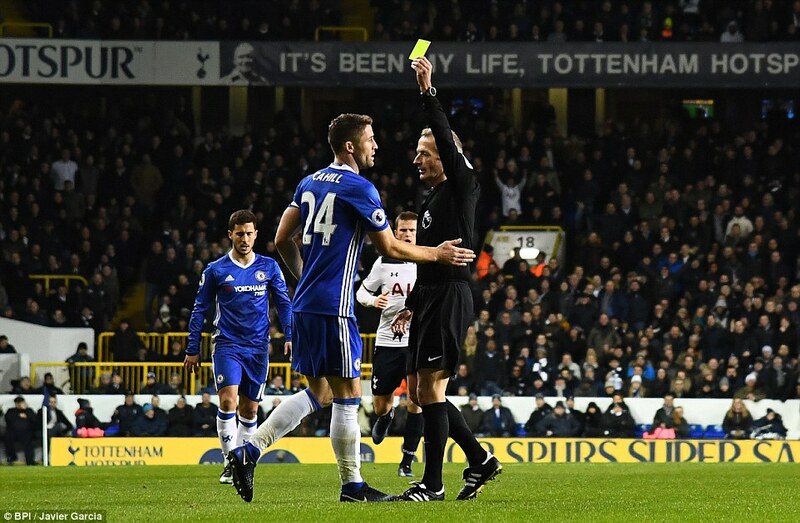 In the 38 th minute, Gary Cahill headed the ball straight to Erikssen, and could only respond by hauling him back in the most obvious fashion, giving referee Martin Atkinson no alternative beyond a yellow card. He wasn’t the first either. 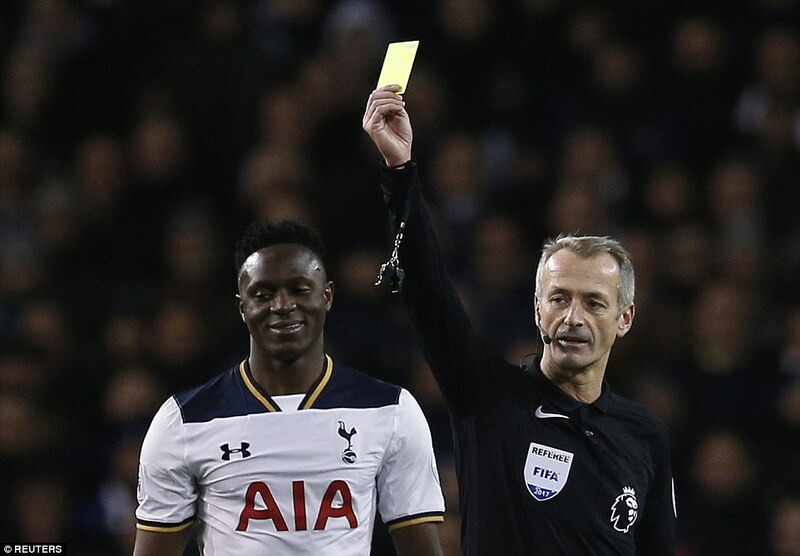 Pedro was booked for a crude challenge on Danny Rose after 18 minutes and Wanyama for a similar challenge on Hazard. 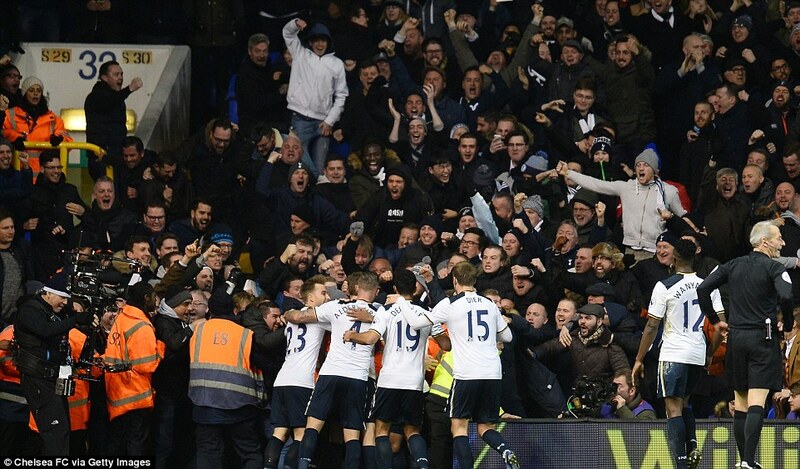 It was these delays that forced the extra minutes of injury time in which Tottenham scored. 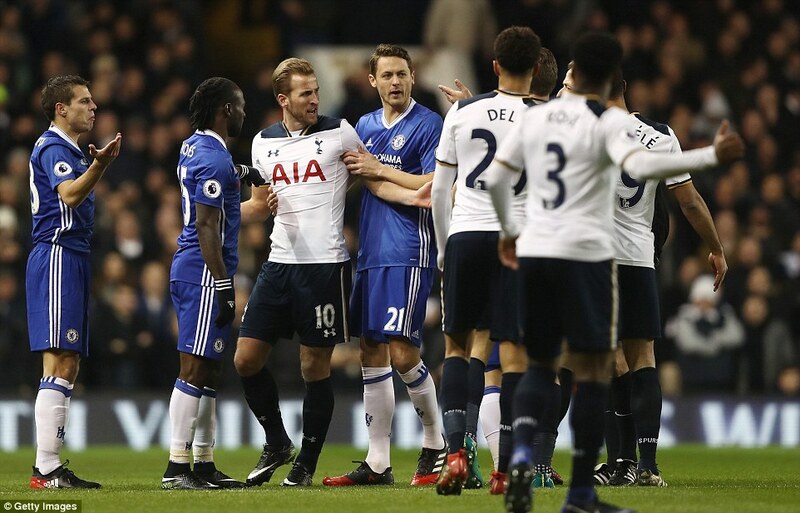 Kyle Walker played the ball inside to Erikssen and his cross saw Dele Alli get in between Victor Moses and Cesar Azpilicueta to lift a quite perfect head out of the reach of Courtois. 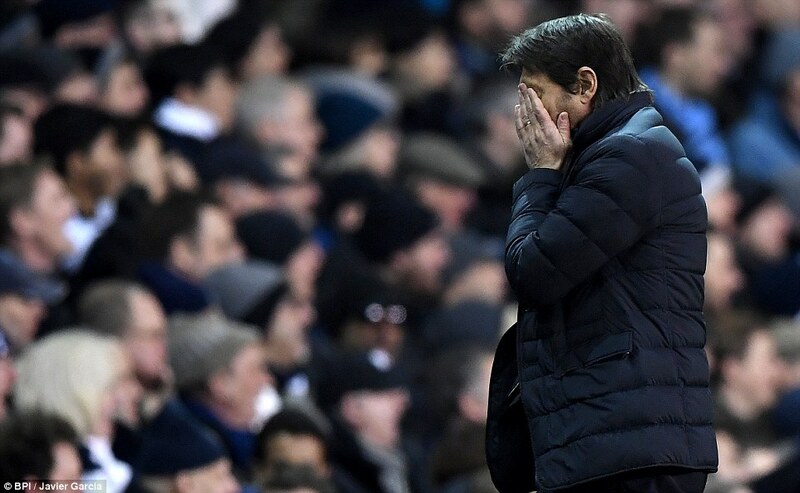 There was hardly time for the restart before the whistle blew, Antonio Conte’s turning swiftly on is heels for what was no doubt a half-time of the greatest intensity.